This was at the Red Bounce Party, organized by Darlene MacNeil. The worst of my recent problems had not yet befallen me, so I was still able to make the keep on rockin' sign with some conviction. Note my excellent taste in t-shirts once again. 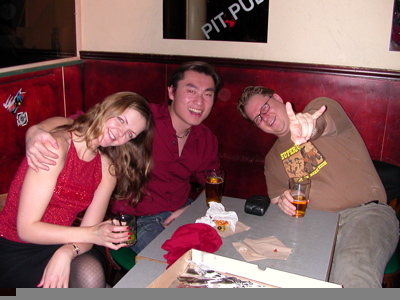 This is something of a UVIC reunion table, we also had the foresight to have a pizza made by Pie R Squared Pizza as the Pit was not serving food and stopped serving pitchers of beer too. Falicita's would never stop serving pitchers of beer, it's inhuman. Gary K. Lau has his own blog now. Not that he bothered to tell me. Not that I could read it anyway right now. It's a sad, sad world.